A 35-year-old man from Bremerton died Wednesday when his motorcycle crashed while he was riding on U.S. Highway 26 in Eastern Oregon, The Seattle Times reports. According to the Oregon State Police, 35-year-old Michael Bartlett was riding with a group of motorcyclists through the Unity area Wednesday when he lost control of his bike and left the roadway. He then overcorrected and ended up flipping the bike several times, ejecting him in the process. Bartlett was reportedly wearing a helmet at the time of the crash, but his injuries were too severe and police pronounced him dead at the scene of the motorcycle accident. 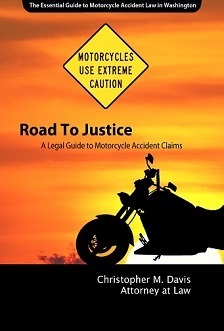 The motorcycle accident attorneys at Davis Law Group have years of experience representing people who were injured in motorcycle accidents. If you or a loved one has been injured in a motorcycle accident, consulting with an attorney will help you to better understand your option. To schedule a free no-obligation legal consultation, call Davis Law Group today at 206-727-4000.